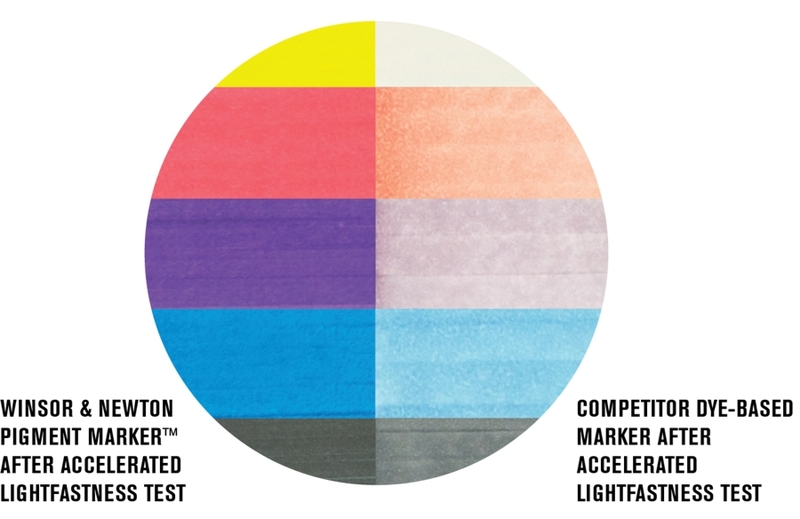 Introducing the new Winsor & Newton Pigment Marker™ – a pen so revolutionary it will change the way you work forever. 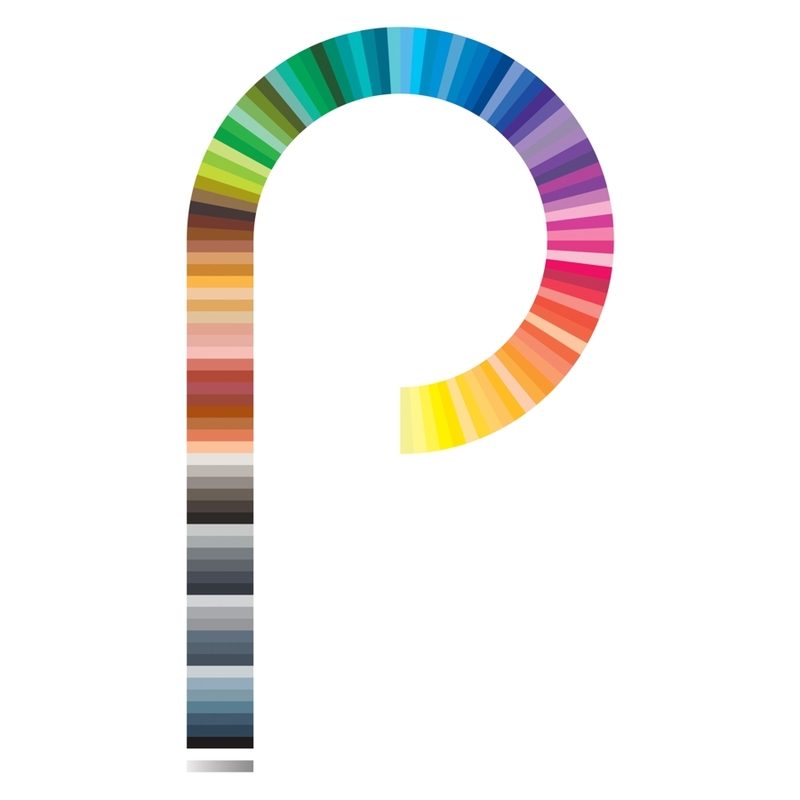 Using only the highest grade, lightfast, fine art pigments, there are over 100 beautiful colours to choose from. There's also a unique White Blender that places a limitless palette of tones and hues at your fingertips. This is no ordinary marker. This is creativity without limits. Vivid, bright and delicious, the Pigment Marker in Apple Green allows its yellow undertones to peek to the fore. With a distinct, green undertone, the Pigment Marker in Azure is the perfect deep blue addition to your palette. 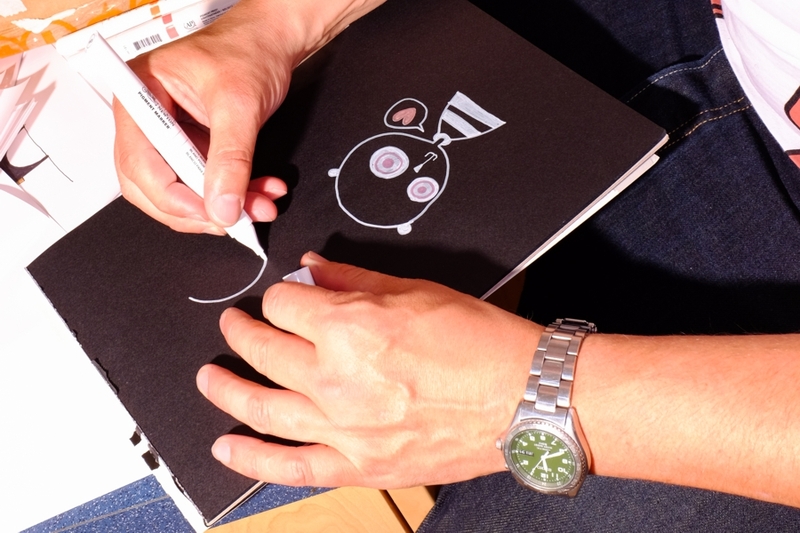 The Pigment Marker in Black is a staple part of your collection. Going further than a traditional black, it is imbued with blue and violet undertones for a sumptuous finish. If you're seeking a mid-shade blue that has undertones greyer than they are green, try Blue Grey. One of our most intense greens, the Pigment Marker in Bright Green has a strong yellow undertone. Brilliant Yellow gives a bright, warm yellow. Whether drawing a nature scene or something a little more abstract, it will bring a warm tonality to your composition. Brilliant Yellow Light gives a pale, warm yellow. Whether drawing a nature scene or something a little more abstract, it will bring a warm tonality to your composition. With its extra-strong orange undertones, the Pigment Marker in Burnt Orange glows from within. The earthy undertones of the Pigment Marker in Burnt Umber make it the perfect reddish brown for your natural scenes. A paler tone of its original counterpart, Burnt Umber Light is a pale, reddish brown colour with earthy undertones. A single-pigment colour, Carmine is a mid-shade crimson red with subtle, blue undertones. The Pigment Marker in Clay is a pale brown colour with grey undertones. 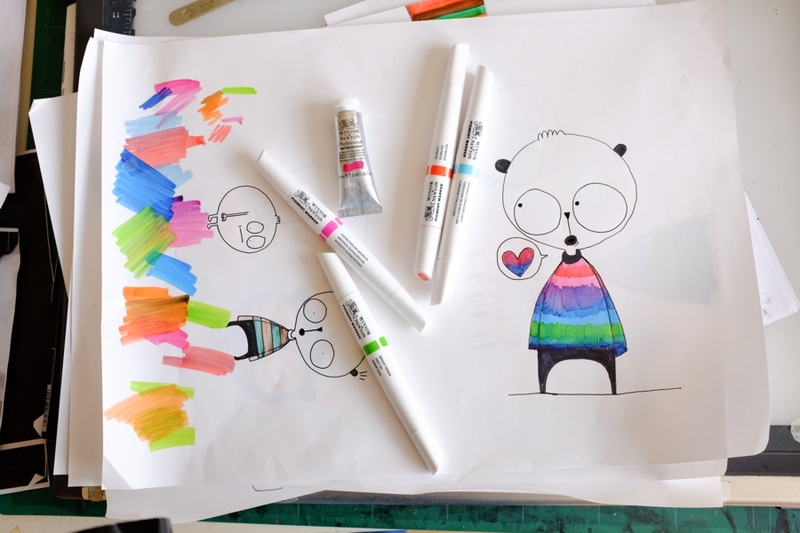 Of the Pigment Marker's 24-strong greyscale, the spectrum of Cool Greys is the coolest, providing six refreshing, neutral tones. Cool Grey 3 is the third lightest of these shades. Of the Pigment Marker's 24-strong greyscale, the spectrum of Cool Greys is the coolest, providing six refreshing, neutral tones. Cool Grey 4 is the third darkest of these shades. Of the Pigment Marker's 24-strong greyscale, the spectrum of Cool Greys is the coolest, providing six refreshing, neutral tones. Cool Grey 5 is the second darkest of these shades. Of the Pigment Marker's 24-strong greyscale, the spectrum of Cool Greys is the coolest, providing six refreshing, neutral tones. Cool Grey 6 is the darkest of these shades. A unique shade within the Pigment Marker spectrum of orange colours, Coral is an orange colour with subtle red undertones. For when you’re seeking earthier undertones, try the Pigment Marker in Dark Green. For our deepest violet colour, try the Pigment Marker in Deep Purple. Eye-catchingly bright, the Pigment Marker in Emerald is a sumptuous green that brings outs its yellow undertones. Occupying a mid-range spot on the Pigment Marker colour spectrum of greens, the Pigment Marker in Forest Green brings interesting yellow undertones. Golden, green and earthy, the Pigment Marker in Green Gold has a yellow tinge to it, making it perfect for natural scenes or abstract compositions. A lucid tone in the Pigment Marker colour spectrum, Henna is a mid-shade brown with undertones of orange, making it patricularly vivid. The Pigment Marker in Indian Red is warmed by its red, brown and earthy undertones. A pale brown shade, the Pigment Marker in Indian Red Light has a strong, red undertone. Displaying slight grey undertones beneath its dark blue upper layer, Pigment Marker in Indigo will bring mystery and depth to your Pigment Marker palette. The Pigment Marker in Lavender provides you with a pale tint of violet. With pink and grey undertones, it is earthier than the rest of the Pigment Marker spectrum of purples. Made from a single pigment, the Pigment Marker in Lemon Yellow gives you a bright yellow colour with a green undertone. As part of the Yellow Hansa group of modern pigments first developed by Hoechst, it has been available for artistic use since the early 1900s. Made from a single pigment, the Pigment Marker in Lemon Yellow Light brings a pale green shade of yellow to your composition. As part of the Yellow Hansa group of modern pigments first developed by Hoechst, it has been available for artistic use since the early 1900s. A subtle brown sitting in the Pigment Marker spectrum of earth tones, the Pigment Marker in Light Brown is a pale brown shade with a yellow undertone. If you're looking for a magenta with blue undertones, try the Pigment Marker in Magenta Light (Blue Shade). With a subtle mix of magenta and violet pigments, it gives a real colour impact to any composition. Made with fine art violet pigments, the Pigment Marker in Light Purple gives a delicate and pale violet finish. As the palest shade in the magenta spectrum of the Pigment Marker, Light Rose is a pale red with strong, pink undertones. Eye-catching, vivid and bright, the Pigment Marker in Lime Green is a sumptuous green that brings outs its yellow undertones. One of our subtler shades in the Pigment Marker spectrum of earth tones, the Pigment Marker in Linen is a pale yellow colour with a base of brown. Try the Pigment Marker in Magenta Light (Blue Shade) for a magenta with blue undertones. A subtle mix of magenta and crimson pigments gives Magenta Red Shade more red than violet undertones. The Pigment Marker in Mauve is a blend of pigments, providing you with a rich, violet colour. Heading into the lighter end of the spectrum of earth tones, the Pigment Marker in Medium Brown allows its yellow undertone to peek through to the surface. One of the lightest shades on the Pigment Marker spectrum of greens, the Pigment Marker in Mint Green Light has a yellow undertone to its overall pale green colour. One of six on a spectrum of Neutral Greys, Neutral Grey 1 is the lightest of these cool, dusky greys. One of six on a spectrum of Neutral Greys, Neutral Grey 2 is the second lightest of these cool, dusky greys. One of six on a spectrum of Neutral Greys, Neutral Grey 3 is the third lightest of these cool, dusky greys. One of six on a spectrum of Neutral Greys, Neutral Grey 4 is the third darkest of these cool, dusky greys. One of six on a spectrum of Neutral Greys, Neutral Grey 5 is the second darkest of these cool, dusky greys. One of six on a spectrum of Neutral Greys, Neutral Grey 6 is the darkest of these cool, dusky greys. With a greyish, yellow undertone, the Pigment Marker in Olive Green has an interesting set-up of colour beneath its upper layer of dark green. Displaying a greyish yellow undertone beneath its pale green surface, the Pigment Marker in Olive Green Light has an earthy, natural feel. The Pigment Marker in Parchment is a pale brown with a range of undertones present: its colour is blended with greys, yellows and pinks. A multilayered colour, the Pigment Marker in Petrol Blue gives off a green shade of blue with deeper undertones of dusky grey. Intense, with a jewel-like green undertone, Phthalo Blye is a mid-shade blue made from the Phthalocyanine Blue pigment. Intense and deep, the Pigment Marker in Phthalo Blue Deep gives off a green undertone to its upper layer of blue. It is made from the modern pigment Phthalocyanine Blue, which was first introduced in the 1930s. One of our palest shades of blue on the Pigment Marker colour spectrum, Phthalo Blue has a unique green undertone. The Pigment Marker in Phthalo Teal sits in the Pigment Marker spectrum of greens, with blue and grey undertones giving it depth. Crossing the line between pale blue and green, the Pigment Marker in Phthalo Turquoise Light is a particularly interesting colour to explore in conjunction with White Blender. Dusky and classic, the Pigment Marker in Portrait Pink is the most blushing shade in the Pigment Marker spectrum of earth tones. Deep and autumnal, the Pigment Marker in Potters Pink is a maroon shade with distinctly dark pink undertones. Made with fine art violet pigments, the Pigment Marker in Purple is a mid-range purple colour. 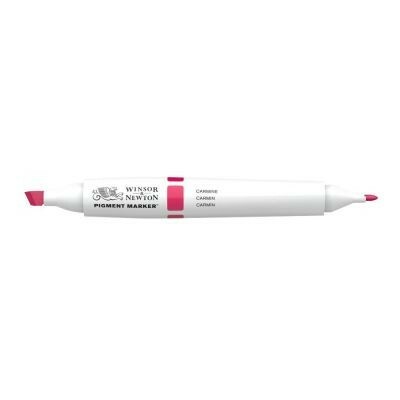 Made from a single quinacridone pigment, the Pigment Marker in Quinacridone Magenta Light gives you a bright, violet colour with strong, red undertones. 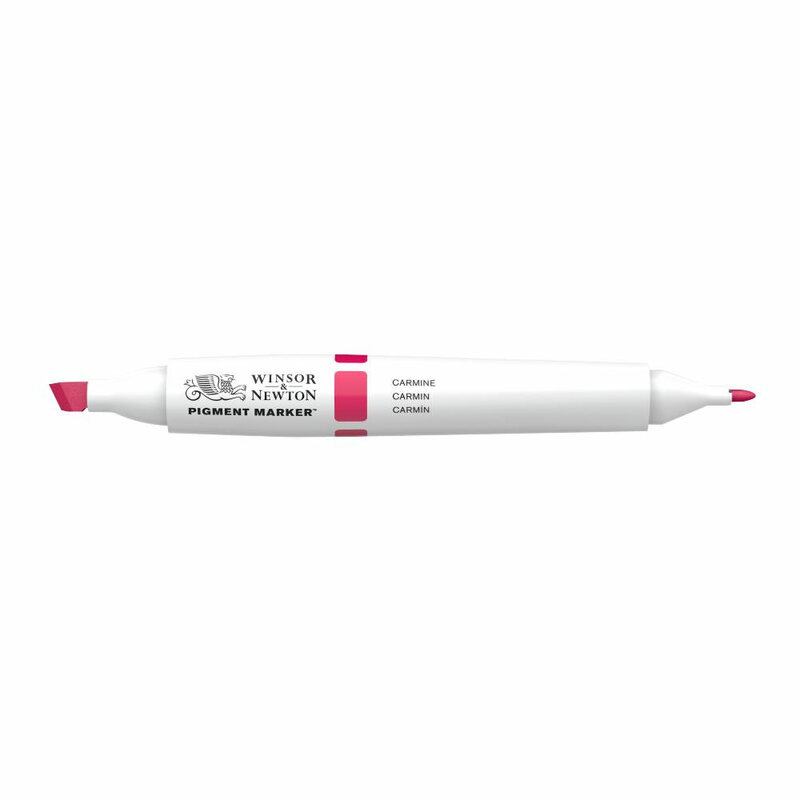 Made from a single quinacridone pigment, the Pigment Marker in Quinacridone Magenta gives you a bright, violet colour with strong, red undertones. Deep and impactful, the Pigment Marker in Red Henna will bring a strong, rouge stain to your composition, with the addition of brown and orange undertones. Pale yet strong, the Pigment Marker in Red Henna Light has rich undertones of orange and brown. This light crimson shade gives off beautiful, pink undertones. Rich, deep and deserving of its title, the Pigment Marker in Royal Blue is made from fine art pigments to give you the ultimate blending effects. This mid-shade blue comes with violet undertones to give a subtle effect. Occupying mid-range spot on the Pigment Marker spectrum of greens, Sap Green displays a yellow undertone for brighter compositions. Made from a single pigment, Scarlet gives a bright red with yellow undertones. Interesting and deep, Sepia is a blackish brown with red undertones. As pale blue as a clear summer sky, the Pigment Marker in Sky Blue is a greener shade of blue made up of fine art pigments. In the Pigment Marker spectrum of Toner Greys, there are six slightly cool, smokey tones. Toner Grey 1 is the lightest of these shades. In the Pigment Marker spectrum of Toner Greys, there are six slightly cool, smokey tones. Toner Grey 2 is the second lightest of these shades. In the Pigment Marker spectrum of Toner Greys, there are six slightly cool, smokey tones. Toner Grey 3 is the third lightest of these shades. In the Pigment Marker spectrum of Toner Greys, there are six slightly cool, smokey tones. Toner Grey 4 is the third darkest of these shades. In the Pigment Marker spectrum of Toner Greys, there are six slightly cool, smokey tones. Toner Grey 5 is the second darkest of these shades. In the Pigment Marker spectrum of Toner Greys, there are six slightly cool, smokey tones. Toner Grey 6 is the darkest of these shades. Inspired by Vandyke's palette, the Pigment Marker in Vandyke Brown is a dark brown with yellow and orange undertones. For when you’re seeking grey undertones on an overall green colour, try the Pigment Marker in Verdigris. When seeking a bright red with orange and yellow undertones, choose Vermillion Hue. The Pigment Marker in Violet Blue Deep offers violet undertones to its overriding deep blue hue for a majestic effect. Sitting on the yellower side of the Pigment Marker spectrum of greens, Viridian Hue is a vivid shade that begs to be explored with White Blender. Winsor Orange Light (Red Shade) gives off a light orange with subtle, red undertones. On a spectrum of six Warm Grey shades, the Pigment Marker in Warm Grey 1 is the lightest colour. On a spectrum of six Warm Grey shades, the Pigment Marker in Warm Grey 2 is the second lightest colour. On a spectrum of six Warm Grey shades, the Pigment Marker in Warm Grey 3 is the third lightest colour. On a spectrum of six Warm Grey shades, the Pigment Marker in Warm Grey 4 is the third darkest colour. On a spectrum of six Warm Grey shades, the Pigment Marker in Warm Grey 5 is the second darkest colour. 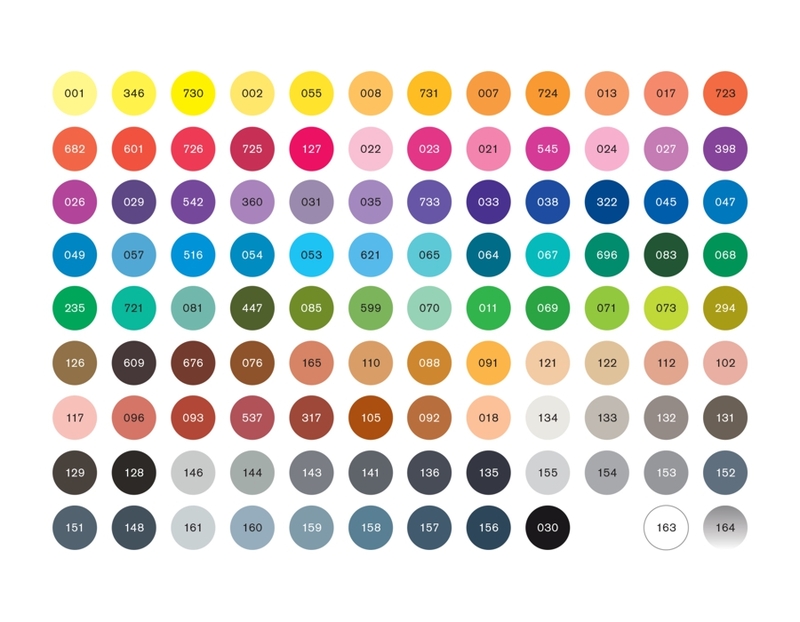 On a spectrum of six Warm Grey shades, the Pigment Marker in Warm Grey 6 is the darkest colour. Light and bright, yellow undertones emerge through the thick green of Winsor Green (Yellow Shade). Winsor Orange is thoroughly bright, with slight red undertones. Placed within the orange segment of the Pigment Marker colour spectrum, Winsor Orange (Red Shade) is a bright orange colour with subtle red undertones. Occupying a mid-range spot on the Pigment Marker colour spectrum of reds, Winsor Red is a warm shade with orange undertones. When seeking a sumptuous, deep, crimson, try Winsor Red Deep. The Pigment Marker in Winsor Violet Dioxazine Deep is made from a single pigment to give a deep, sumptuous purple colour. The Pigment Marker in Winsor Violet Dioxazine is made from a single pigment to give a vivid, mid-shade purple colour. 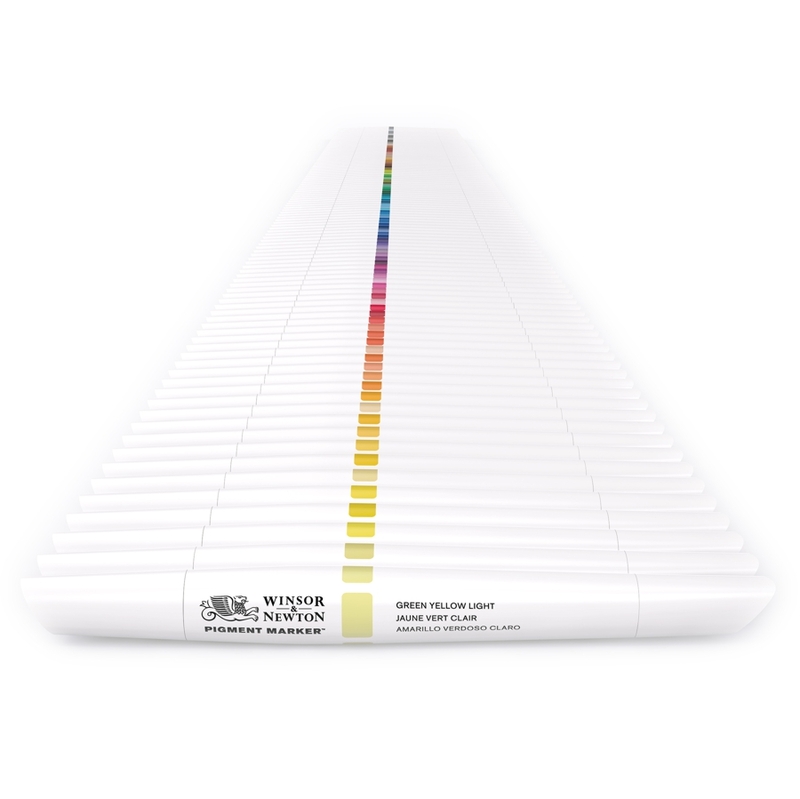 Made from a single pigment, the Pigment Marker in Winsor Yellow provides a pure, warm, yellow colour. As part of the Yellow Hansa group of modern pigments first developed by Hoechst, it has been available for artistic use since the early 1900s. Winsor Yellow Deep gives you a warm, reddish shade of yellow. Warm and earthy, the Pigment Marker in Yellow Gold allows its brown undertones to shine through. Paler than its original counterpart, the Pigment Marker in Yellow Gold Light maintains subtle brown undertones. The Pigment Marker in Yellow Green is perfect when you seek a colour with a stronger yellow undertone than Lime Green. Yellow Orange has subtle, yellow undertones to its overall orange shade. Yellow Orange Light provides you with a pale orange with subtle yellow undertones. Great stuff! Awful cap design. Windsor & Newton marker pens are a brilliant range of colours.